The birthday girl most certainly needs a special party hat. And what better than a train engineer hat for a train themed party? 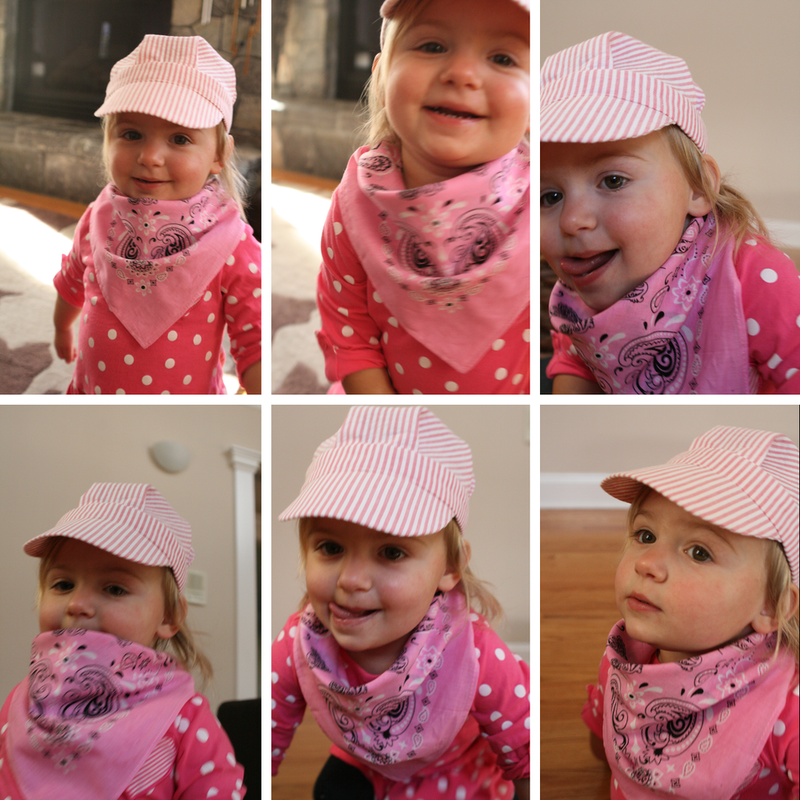 I looked into buying Myla a pink engineer hat and found some online. However, all the reviews I read talked about how flimsy they were and how they weren't made very well. I wanted to make sure her hat was going to last through all her rambunctious play. Therefore, I decided to make her one. I've never attempted to make a hat like this before… or really anything that even resembled a hat but figured I'd give it a shot. I tried my best to document what I did so you can make one too for your little engineer if you so desire. Please note: Diagram is not to scale. Here is the sample hat I created which I used for my pattern pieces. 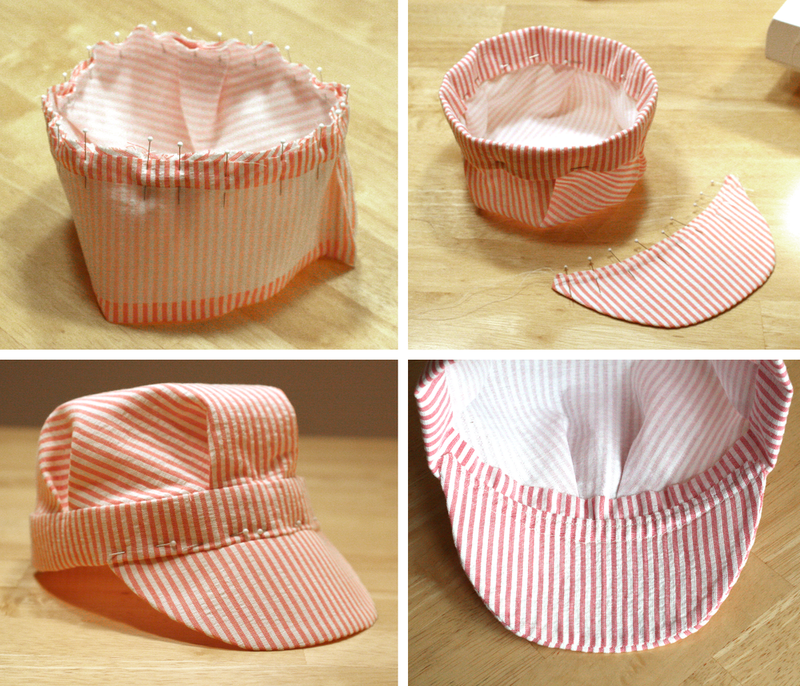 I laid out the pattern on my fabric (pink striped seersucker), cut the pieces, and then sewed the brim fabric together. I made sure to cut the seam allowance down to 1/4" where I sewed the two pieces together before I flipped them inside out. I cut fusible interfacing for the main hat fabric and band (minus seam allowances). And, I cut a piece of the fuse-n-shape for the brim which is quite stiff but still soft. It's the same material I used for Myla's Garden Gnome Halloween Costume. After some tugging and adjusting the fabric over the fuse-n-shape, I ironed it for a permanent hold. For the pleats, I took them in enough so once sewn, the circumference would match the inside circle which is Myla's head measurement plus 1". (See diagram above for direction of pleats.) After sewing the pleats in place at about 3/4" from the edge, I sewed the ends of the band together to form a circle and pinned it into place on the hat. I sewed that around at 1.25" (the final band width). Then, I flipped it into the inside of the hat and tucked the seam allowance under and pinned it into place. I hand stitched it so the stitch marks would not show on the outside of the hat. Then, I tucked the seam allowances in on the brim and pinned in place. I ran the edge through the sewing machine. Once that was finished, I pinned the brim in the place on the hat and hand stitched along the edge AND also took slightly wider stitches where the edge of the hat meets the brim so everything is secure and there are no lose edges to cause irritation. In retrospect, I probably should have made the band in two pieces so the brim edge would be completely hidden inside the seams. And perhaps I could have made the hat slightly bigger than she needed and added some elastic in the back too. Ah, all the things I think about after finishing a project. Since I had to once again use the TV to get good (yet very serious looking) shots of Myla wearing her hat (at top of post)… I had to share these silly pictures of her too. When she's not mesmerized by the TV, she's trying to steal the camera. As I've been crafting away this last week, I've got so many more fun train-themed surprises to share in the coming weeks… So check back next week!